Gaming Blogging – Page 2 – Welcome to the World of Games! On this page we have provided you with the definitions for a list of some of the terms often used in poker, as well as a few computer related terms. ACE-HIGH: A hand with an Ace but no flush, straight or pairs. ADD-ON: An option during a tournament to purchase more chips. AGGRESSIVE: Adjective to describe a player who raises and re-raises and rarely calls. ALL-IN: When you run out of chips during a hand, but don’t wish to fold, you are all-in. This means you have the potential to win a share of the pot up to and including your last contribution to that pot. You cannot share in any bets added beyond that point. These bets form a side-pot. ALL-IN PROTEECTION: When you cannot act in time, or disconnected from the internet, you are put all-in for the hand. The software is “protecting” your hand from being folded instead. ANTE: A forced amount contributed by all players before cards are dealt as a way to create a pot. AUTO-MUCK: To have the software automatically fold your hand at the showdown if it isn’t a winner. AUTO-POST: To have the software automatically post your blind so it doesn’t have to ask you each time. Avatar: A term from computer gaming for an image or figure used to represent a person. BABY FLUSH: A flush made with a low. BACKDOOR: Making a hand other than the one intended. Example: Having J/10 of Clubs with a flop of A of Clubs, 5 of Clubs. 6 of Spades. The turn and river are K & Q of Hearts. You made a straight instead of the intended (and more likely) flush. BACK-RAISE: Re-raise another players raise. BAD BEAT: When a good hand is beaten by a hand that gets lucky. BANKROLL: The amount of money a player has. BET: To place money in the pot. BET OUT: To open the pot with a bet even though you have the opportunity to check. BET THE POT: This term is used in pot limit games. It means your bet matches the current amount in the pot. If, when your turn to bet, the pot was at $14, and you bet the pot, your bet is $14. BIG BLIND: The largest blind posted prior to the dealing of cards. This is usually the player sitting two seats to the left of the dealer. BLIND: A mandatory bet placed before the cards are dealt to force money into the pot. You usually have to post a blind when you join a game. Board: The community cards in Hold’em are collectively known as the board. BURN CARD: In Hold ‘Em, the cards before the flop, turn, and river that are discarded to prevent reading of marked cards. BUST OUT: To lose all your chips. BUTTON: A marker, usually disk-shaped, to indicate which player is the virtual dealer. The button is used in games where position relative to the dealer is important. BUY-IN: The amount a player spends to get into a game or tournament. CALL: Matching a bet amount. CAP: In a limit game, betting the last amount allowed before the maximum allowed number of raises is reached. CARDS SPEAK: The rule that your hand is the most favorable possible combination of cards, no matter how you call it. CASH GAME: A game played where the chips have a cash value, as opposed to a tournament where the chips do not have a cash value. CASHOUT: To transfer money from a poker site to a personal account. CATCH: To hit alot of your hands. CHECK-RAISE: The act of checking, then re-raising a bet. CHOP: To split a pot when both people have the same winning hand. CHOP THE BLINDS: When all the players fold around to the blinds, the blinds decide to take their money back instead of playing the hand. COLLUSSION: A form of cheating where two or more players attempt to gain an unfair advantage by sharing information. COMMUNITY CARDS: Communal cards dealt face up in Hold ‘Em that all players can use. COVER: To have more chips than another player. Crazy Pineapple: A variant of texas holdem where each player gets dealt three cards preflop and discards one of them before the turn card is dealt. It isn’t a top secret for human beings that actually money itself rooted deeply in our whole day-to-day lifestyle – we live in order to earn our living, putting intellectual values behind, but that’s just a point – it is very hard to stop reaping benefits of it all however strong we all may do our best. That is why, with the purpose to calm everyone down and carry them the hope to do make their dreams become a reality, it’s been decided to introduce the following marketing solution, that is free lottery, which permits human beings to rush into peril and thus earn income. Also, there is a golden opportunity to participate in free lottery online – what’s fascinating, it saves time – use the Cyberspace and so you will see that it is a kid’s stuff to wallow in luxury – so, you must make a decision what exactly you’re in need of. Aside from this, it is important to indicate that feel free to download free lottery software, for instance, and obtain the intended effect faster, applying bare minimum attempts, but still don’t become too much obsessive about this not to come a cropper or worse – be left with nothing. Nonetheless, there is state lottery offered for true-born betting games buffs that guarantees you all to hit a jackpot, since, judging from the statistical data, it’s very easy to be cheated. To elaborate above, such sort of wagering game can provide you, folks, with free lottery tickets – a solution, hardly available anywhere else, but it is you that have to decide which kind of gambling game to play, for assuming you’re prudent, and, furthermore, score twice before you cut once, you’ll blossom forth everywhere. It’s not a secret that, for instance, people always look for something new and, what is more, breathtaking, and it does actually give this wonderful feeling to them all: lottery numbers, adrenalin etcetera make them be happy – it will seem to be the absurdity, but still many resort to all this. But, as is known, it is not recommended to go too far not to go daft and get strongly dependent on gambling – it is like drugs: when you start participating, there is no way back. In conclusion, be that very bold spirit, since, as mentioned before, nervous Nellies never will make the entire world go around – free lottery game is most certainly your choice – be up-and-coming, hardly will it let you all get bored. Bear in mind, wagering is not the evil as some are now taking the view – it is amazing world of boundless opportunities. A recent article in the Design and Development section of D&D Insider hinted at the core mechanics for 4th Edition. And since I’m still fishing for good (quality) tid bits of information I dove right into it. From what I’ve read it sounds like WotC (Wizards of the Coast) is doing a great job in making this new edition more than just an excuse to sell us new books. What we mean when we talk about streamlining the system is this: making design decisions that make learning and using the game less difficult, while keeping the system just as robust. And making it more fun as the result. If you want to know whether or not you succeed in doing some action in 4th Edition, you grab a d20 and try to roll high. Just as in 3rd Edition, you add a modifier to that roll from your character sheet, and you check for any extra bonuses or penalties from the situation or from your allies. The key difference in the new edition is what you roll for and what you add. The standard defenses remain (AC, Fortitude, Reflex, and Will) but now they all work more like AC. When a dragon breathes fire on you, it attacks your Reflex and deals half damage if it misses. The DM rolls a d20, adds the dragon’s modifiers, and asks you what your Reflex score is. The dragon might roll a 1 and automatically miss no matter how much tougher it is than you, but there’s also the frightening possibility that it will roll a 20 and deal double damage. Folks familiar with the new Star WarsSaga system will recognize this concept, but it’s evolved a bit to better suit D&D. In 4th Edition, when a creature only needs to touch you to deliver an attack, it targets your Reflex. When you’re surprised, you grant combat advantage, but you don’t need to look at a special AC on your sheet — the normal number works fine. When a pit suddenly opens up beneath your feet, you make a check to jump out of danger, but if a crossbow trap fires an arrow at you, it the bolt attacks your AC. That’s pretty interesting. So gone are the somewhat confusing touch and flat-footed ACs? No more Saving Throws? I may be a bit sad to see the classic Saving Throw gone but I do like the idea that they are “defenses” now. Foes will attack the defense rather than PCs trying to avoid a situation. Have you played a spellcaster and been a little envious of the excitement of other players when they roll critical hits? Have you wished that you could do that for your spells? Just guessing here, but I assume wizards will attack the various defenses when they cast spells (hence the ability to roll a crit). But the gods help them if they are dependant on their Base Attack! There has to be another piece to this puzzle. I mentioned in a previous post that Wizards were my favorite class. The new streamlining is only enhancing that feeling. Can’t wait to try out a new Wizard! A good villain is not planning to destroy the town because he’s Chaotic Evil. He’s going to destroy it because he’s Chaotic Evil and he’s got a good reason to hate that town: they branded and exiled him, they executed his father after a rigged trial, or just because they laughed at his froggy familiar. People are sneering, villainous bastards when they act in a particular way. What makes them act that way is what makes them interesting villains as opposed to just another goblin, skeleton, or other faceless mook. Villains are full of powerful, albeit twisted, emotions. They want big, dramatic things to happen, and they want them badly: demonic summoning, war and plague, the destruction of entire cities and nations, the slow torture of the innocent, or the death of knowledge. Not exactly the sort of gold, food, and magic that goblins and giants care about. Actually, the comparison to standard monsters is very revealing. Monsters without clear motivations aren’t villains; they’re just combat-shaped obstacles in the game. Villains have plans, and the good ones also have style. Villains make the players react to them, striving to foil their plans. They ooze bad intentions, and they have goals and the ability to reach those goals. Choosing a CR, class, and equipment for a villain is only half the design challenge. Motivation is the key element for a truly great villain. And giving a villain a great motivation has the happy side effect of making the rest of your adventure design easier. It suggests possible allies for a villain. It clarifies the right targets for your villain to strike. It suggests what the villain does next if the adventure derails. It helps players figure out the villain’s goals. For example, if a villain is a dragon who seeks to recover a gem stolen from its hoard, it might first choose targets such as merchants and wanderers travelling between villages. It might even ally itself with a group of bandits who promised to return its gem to it, gathering information in ways that the dragon could not. If the party does not choose to follow the adventure hook of the “bandit dragon,” it might soon escalate to attacking and looting a village or small town, with a special focus on jeweler shops. The goal is obvious: regain the gem (or failing that, sooth the heartache of losing it by collecting other gems to replace it). A dragon whose motive is finding a mate might act quite differently, as would a dragon seeking revenge for the destruction of its eggs (which might burn out villages indiscriminately, and harbor special hatred for armored foes). Motive makes them distinct. The most common motives of a villain are all familiar from books and movies: vengeance, greed, lust for power, abuse of authority, impersonation by evil forces, religious zealotry, and madness. Other motives are less familiar: villains who act out of love, out of fear, shame, and out of error (Lear). Some of these make excellent motives for adventures, specifically because they don’t get a lot of play in standard fantasy item-quests. For instance, imagine an elvish villain. This elf is a spurned lover who seeks to destroy a noble woman and her family: he tries to impoverish her, ruin her reputation, and poison her new lover. The actions may not initially seem directed at the noblewoman at all (the poisoning is indirectly aimed at her, the loss of money could just be a crime of greed). Once players understand the motive in this adventure, they’ll understand the villain and know where they can confront him. You can go overboard with motive, of course. Not every encounter with mooks, hirelings, and minions need a motive; some monsters are just evil and need killin’. That’s usually the case for the majority of combat encounters. Oftentimes the only combat encounters that require you to define motives, aside from the main villain himself, are the NPC allies of the villain. For instance, a half-devil lieutenant who stalls the party may be deceptively friendly as part of a switch encounter. Others may attack the party’s mounts to slow down pursuit of the master villain, or they may be paid informants for the villain, false friends who lead the party into danger, or an invisible voice who tries to talk the party out of its goal. These types of short-terms goals are typical of the real villain’s servants. What’s the difference between a motive and a goal? A motive is the reason why a villain is a psychopathic killer with reckless disregard for life and happiness. A villain’s goals are the way he shows his reckless disregard for everyone else’s life and happiness. It’s the difference between inspiration to act, and the specific action. Sometimes, the villain’s motive is simple, but his methods are not. Second to the creation of a powerful, useful villains are the creation of solid goals and powers. These define the villain’s abilities and make him or her a worthy adversary for the players. When I wrote the villains for Castle Shadowcrag, for instance, I knew what they wanted but not how they would achieve those goals. Over the course of writing the adventure, I figured out how they’d get there: I used a new monster, the shadow fey, to do some of the villainous work required, and gave them powers that supported those goals. It’s not necessary to design whole new creature types (in my case, I went a bit overboard). 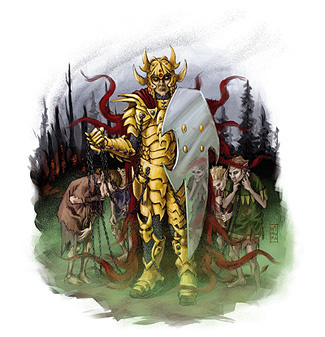 What’s necessary is creating a worthy adversary, a monster or NPC who has both the intelligence and the magic or class abilities to give the party a real challenge, not just a slugfest. Flight, invisibility and teleportation are common tools, but they aren’t necessarily the best for a villain; a fighter who can go toe-to-toe with the party and laugh off wounds (until they discover his weakness) is at least as much fun as the villain who is merely hard to catch. In any case, villains should stand above the common ranks of monsters and minions. The usual tools are elite ability scores and AC, well-chosen magical items, or spells such as mirror image or create fetch, and (in the non-mechanical category) important status or favors owed to the villain. Ability scores are pretty obvious; the elite array is given in the Monster Manual, page 290. Having exceptionally high Armor Class (and at higher levels, Spell Resistance) simply means that a villain lives longer in combat and has a better chance of survival. I’ll have more to say on villains in combat in a future installment in this series, but mention now that defensive powers are more important than offensive ones for villains. Magical items should be limited to one or two defining items that help a villain get away with it. Invisibility, heal, and non-detection powers are all pretty popular choices. But ideally, some of a villain’s toys should force the party to make difficult choices—for instance, using charm spells to create a group of innocent bodyguards out of villagers is a truly villainous thing to do. The tricks from Complete Scoundrel are appropriate for many villains, who love to outwit and outsmart heroes. The Luck feats and tricks are especially appropriate for the bad guys, as they allow them to avoid critical hits or failed saves which could end an encounter. And frankly, villains need to be lucky to survive against PCs; Complete Scoundrel simply builds some useful guidelines around that luckiness. The important thing to remember is that sometimes it’s best if a villain’s abilities don’t pack a lot of offensive punch, but keep a villain alive and provide leverage against his innocent victims. This forces a truly motivated villain to rely on minions and allies, a topic I’ll pick up in the next installment of the Villains series. Understanding and building on the motivations of your main villain can make it easier to keep a villain focused, and to decide how they react when the party does something unexpected. Above-average defensive powers keep a villain alive to grow into a long-term threat rather than a one-shot obstacle.